You can change your feelings, release your emotions, change the script of your life and once more be on top of the world by using 6 easy skills. You can have the power to change everything, right away, if you want to. You can leave the pain behind and reach a level of happiness and peacefulness with these easy to use skills.These skills are not miracle skills but they are very powerful skills. The… y are, simply put, commonsense basic skills that teach you, one step at a time, to release what you hold onto and to allow yourself to change easily and to create the scenario in life that you want to have. These 6 skills enable you to feel safe and secure within yourself, to release emotion and old baggage, to find your self esteem, to give yourself permission to take the right risks, to find what you want instead of dwelling on what you do not want, how to focus at will, and to be in a state of oneness within yourself no matter what happens in the outer world. These six skills should have been taught to you in kindergarten but your teachers only knew them in pieces. Put together in a logical do-able order they give you the key to success and the secret of being in the moment. In the moment all of our problems have solutions. 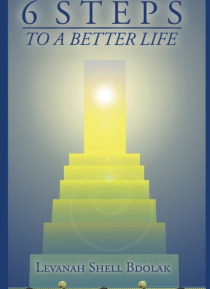 6 STEPS TO A BETTER LIFE is the result of 25years of exploration and experience in showing people skills to change and transform their lives on a practical level. The skills presented in this book are new innovative methods easily used in our modern hectic lifestyles. There is no one who could not benefit from using these skills. These skills can really change anyones life who uses them consistently. Levanah Shell Bdolak, the author of this book, has many testimonials from clients and seminar attendees who have successfully used these skills.